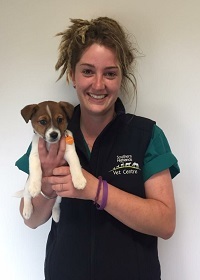 Zoe is currently undertaking her Certificate IV in Veterinary Nursing. She has both studied and worked in the areas of Outdoor Recreation and Horticulture, and is now putting her compassion and love for animals into practice here at the clinic. When she is not at work Zoe loves spending time reading, relaxing and hanging out with her pets including ‘Cooper’ the fun-loving Kelpie pup, ‘Sadie’ the Greyhound, ‘Squid’ the hairless Sphynx, and her two mischievous moggies ‘Thermal’ and ‘Mahli’.